The Louisville Kentucky VA Home Loan program is a substantial benefit offered to veterans and select active duty military personnel. It is the only mortgage program to offer no down payments, no monthly mortgage insurance premiums, no prepayment penalties, low interest rates, and a simple qualification process. To learn more about VA loans or to start the application process, continue reading this guide. What Is a Kentucky VA Loan? VA loans are underwritten by private banks but guaranteed by the Department of Veterans Affairs via the funding fee. Unlike other types of home loans, veteran loans do not typically require any down payment. Borrowers who do not make down payments are not forced to pay for monthly private mortgage insurance. VA borrowers with an existing VA loan are eligible for the VA streamline refinance loan. 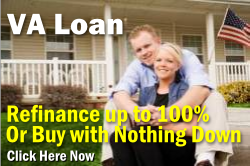 The most substantial benefit of VA home loans concerns the down payment. Veterans can purchase their homes with no down payment, which can save $6,000 to $40,000 out-of-pocket on a $200,000 home. In contrast, FHA loans require at least a 3.5% down payment and the money down for conventional loans runs even higher. Additionally, borrowers who put down less than 20% are typically charged mortgage insurance premiums. Another advantage of a Kentucky VA mortgage is assumability. Veteran loans can be taken over by another qualified veteran under the original loan terms, while most conventional financing is not. Loan assumption is beneficial when the home you are purchasing falls under an existing VA mortgage or when you would like someone else to take over your loan in the future or when trying to sell your home and mortgage rates are significantly higher than your interest rate. 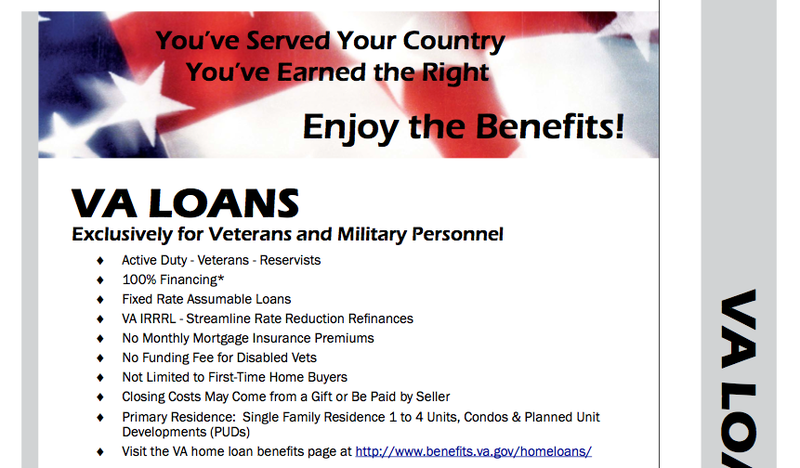 The Department of Veterans Affairs backs a more lenient loan standard than most traditional lenders. While most home loans have two debt to income ratio rates and are limited at a 36% debt-to-income ratio with no more than 28% covering the mortgage, VA borrowers only worry about a single debt to income ratio. The VA loan debt to income ratio is 41%. Lenders use debt to income ratios (DTI) to determine whether borrowers can afford to repay the mortgage. You can use the debt to income ratio calculator on this site to determine your own debt to income ratio or use our VA mortgage calculator. The simplest method for calculating debt to income ratios is to add up the monthly mortgage principal, interest, taxes, and insurance (PITI) and divide the total by monthly gross (before taxes) income. For example, a person with a future monthly mortgage of $800, taxes of $400, insurance of $300, and wages of $4,000 has an approximate debt-to-income ratio of 37.5% (($800 + $400 + $300)/$4000 = 0.375 = 37.5%). The current credit score requirements for a VA Home loan in Kentucky with the lenders that we deal with is 620 middle score for Purchases and full documentation refinances. The VA streamline refinance or IRRL as it is also known requires a 640 middle score. While the Department of Veteran Affairs does not set a maximum loan amount, the total of the loan, VA funding fee, and energy efficient improvements cannot be larger than the appraised value or purchase price. Many mortgage lenders will not grant VA loans beyond the conforming loan limits currently set at $417,000 for the continental United States and $625,500 for Alaska, Hawaii, Guam, and the U.S. Virgin Islands. The VA will guarantee only 25% of this conforming conventional loan limit based on the county where the property is located. It is this VA guaranty, also known as the veteran's full entitlement, that permits veterans to take advantage of favorable mortgage loan terms without a down payment. If you are considering a VA-backed home loan for a purchase or mortgage refinance, you should start the home loan process soon. At a minimum use our VA mortgage calculator with taxes and insurance to estimate a VA piti mortgage payment. Even if you do not hold a purchase contract, you can be pre-approved for a VA loan for when your dream home comes into sight. Mortgage pre-approval lets you know the maximum purchase price you can afford and the estimated p.i.t.i. mortgage payments you will have. To get started on your VA mortgage, follow the steps below. The first step to getting a VA home loan is to make sure that you meet the general loan requirements. Are you eligible for a VA loan? If you fall into one of the categories below, excluding dishonorably discharged personnel, you are typically eligible. 24 months of active duty or the full service of active duty orders lasting 181+ days during July 1947 to June 1950, February 1955 to August 1964, or May 1975 to August 1990, or August 2, 1990 to present. Discharges for service-connected disabilities, hardships, or medical conditions are reviewed before approval. Do you have a debt to income ratio of less than 41%? Use the information presented above to calculate your number. Once you are eligible to participate in the loan program, you can collect the documents needed. Finally, all necessary documents will be sent to the va mortgage lender for underwriting. You may be asked for more information, or you may just receive your full or conditional VA loan approval within a few weeks. Once your Kentucky VA home loan is approved, your have a fully executed purchase contract and VA appraisal, you are ready to schedule a closing and complete the transaction. In most cases, a Kentucky VA home loan is a simple, affordable way for former/current active duty personnel to buy or refinance a property. If you are an eligible Veteran, the VA loan program is right for you, take the next step today.